SIHH 2018: Audemars Piguet Royal Oak Offshore Diver 18K Pink Gold Case and Titanium Bezel ref. 15711IO. Live Pictures & Pricing. 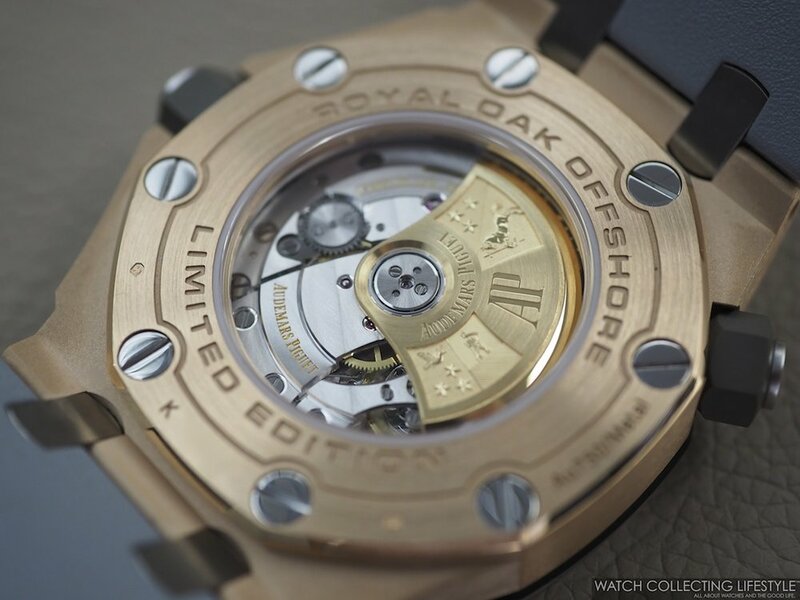 After the success of the Audemars Piguet Royal Oak Offshore Scuba Bartorelli that combined a black PVD case with a bronze bezel and the Royal Oak Offshore Diver QEII Cup 2014 Limited Edition that featured a tantalum case with 18K pink gold bezel —featured here—, it was about time that AP launched a similar combination in one of our favorite metals. The new AP Royal Oak Offshore Diver is fitted with an 18K pink gold case and a titanium bezel, titanium plots, a very light grey dial and a matching grey rubber strap. In person this watch is simply incredible. Clean, monochromatic and very tastefully executed. While the case size remains at 42 mm with a display case back and the beating heart is still the same AP calibre 3120, the biggest difference —other than the obvious— between this Diver and the rest of them, is that the crowns are made of grey ceramic instead of being rubber clad. The perfect dichotomy combining the density and weight of gold with the lightness of titanium. In AP's words, a seductive combination. The new Audemars Piguet Royal Oak Offshore Diver in 18K pink gold will be sold under reference 15711IO.OO.A006CA.01 and we already think that the watch will sell just like hot cakes. 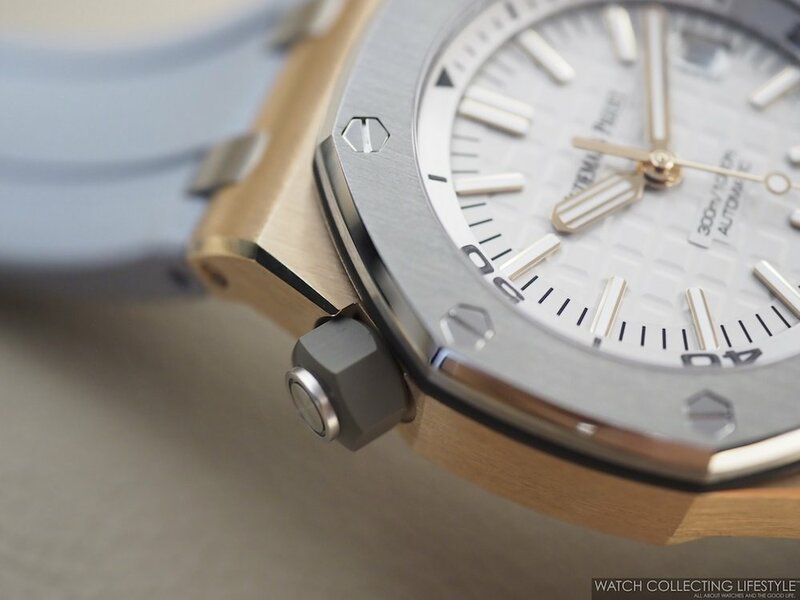 On the wrist, the new Audemars Piguet Royal Oak Offshore Diver 18K Pink Gold Case and Titanium Bezel ref. 15711IO is simply one of the best looking APs in the last decade and very reminiscent of the Royal Oak Offshore LeBron James —we featured here a few years ago— with the same combination of metals and very monochromatic look. The only sad part, is that according to the information provided to us by AP, this new watch will be exclusively available in a limited edition of 500 pieces to be sold at the Audemars Piguet boutiques in Japan. Time to call the Ginza boutique guys! Sticker Price $32,600 USD. For more info Audemars Piguet click here. Posted on January 18, 2018 by Editor & Publisher and filed under SIHH 2018, Audemars Piguet, SIHH and tagged SIHH Mainstream Brands SIHH 2018 Audemars Piguet AP Diver 18K Pink Gold 2018.